We know that on the application of DC voltage, brushed DC motors can rotate 360 degrees continuously. But, what if we aim to position the engine at a particular angle during the rotation? Suppose we need to focus our digital cameras to zoom in and zoom out automatically. There we will use Stepper motors. These are brushless, synchronous DC motors where the entire rotation is divided into the expansive number of steps. Another good thing about the engine is that they can be controlled digitally as an open loop system, i.e., no feedback loop is required for its accurate operation. 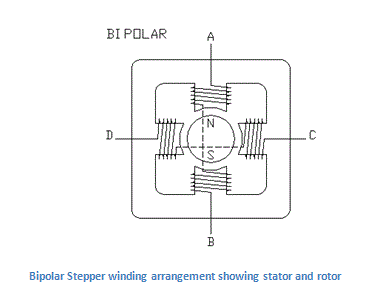 Stepper motors are broadly characterized between 1) Unipolar 2) Bipolar motors. It is called Unipolar motors because unidirectional current flows through each half of the winding of the coils. It consists of 6 leads with a center tap between each of them. It is called Bipolar motors because bidirectional current flows through the entire winding of the coils. It has single winding per stator phase with four leads. For driving a bipolar stepping motor, a driver IC is required with an internal H bridge circuit. The center tap of the Unipolar motor remains connected to either a voltage source or ground which makes the current flow in one half of the winding. This generates polarity on the stator poles, and the rotor starts rotating accordingly. Reversing the polarity of the winding, the rotation is also changed. With this, the motor continues to turn 360 degrees. No center tapping is used in this case, preferably the leads themselves are connected to the power supply or ground which generates stator polarity and continues to rotate the rotor 360 degrees in each cycle. Here the entire current flows in both the directions through the winding at a time. 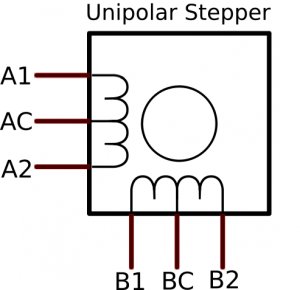 In Unipolar Stepper motors, the coil wire is thinner than its bipolar counterpart. This decreases the resistance of the coil, thus increasing the current flow. Power loss due to temperature is also more significant in Bipolar motors as it has thicker coil windings. Torque is a vector quantity that measures the force that can cause an object to rotate about an axis. 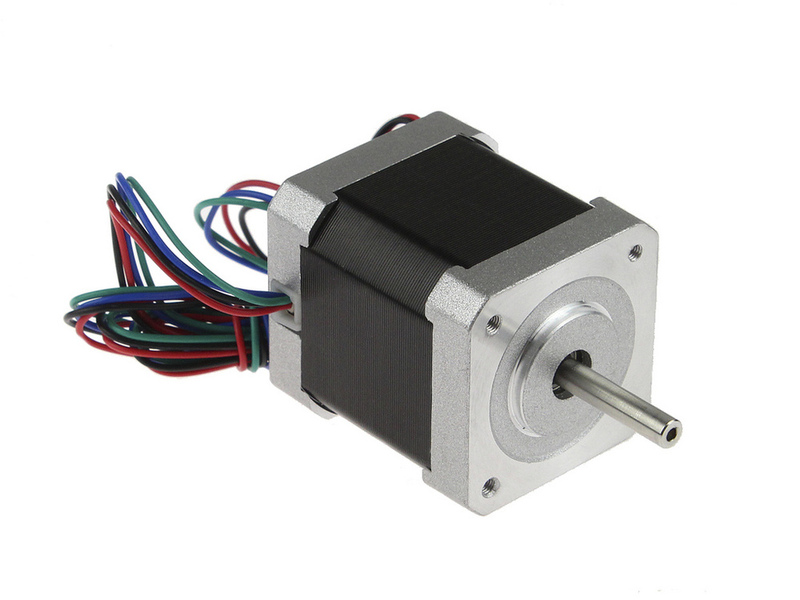 As the current increases, the Stepper motor realizes high torque. Due to its complex circuitry, Bipolar Stepper motors are costlier than Unipolar motors. We can easily create bipolar Motors from Unipolar configuration by just omitting the center tap. Since Torque is related to the current of the winding, Bipolar motors will generate greater torque than Unipolar. Thus High torque stepper motors run in Bipolar configuration. Older and cheaper technologies like Floppy Disk and Compact Disk drives, computer printers used to run on Unipolar Stepper motors as they have a simple structure and space-saving circuitry. But as the technologies are getting smarter and the size of the components is reducing, engineers have been focusing on Bipolar Motors due to its variety of uses. In Lasers and Optics and most recently in 3D Printers, Bipolar Stepper motors are significantly being used. This article talks about the various characteristics of the two stepper motors and how they are different from each other. Hope it would have helped you to grow your knowledge about stepper motors.